There are a lot of things growing on our little spot of paradise. Some are weeds, but as of last year, many are wildflowers. Last Fall, 2015, we spent two long weekends clearing beds and installing about 400 or so natives. Natives don’t look like tulips or begonias. They look a bit like weeds. So, what, are we crazy? No. We are not only fulfilling our mandate from NYC Parks, but we are providing habitat for the insects and birds that live here, or pass through. We intend to plant more of these natives next year, and we really want folks not to yank out the plants we’ve installed. Tip 2: DO NOT PLANT ANYTHING. Again, if you have your own plot, plant whatever. But PLEASE, do not dig anything into any of the SCC perennial gardens, and for the reason, see above. It seems some have assumed they were helping by weeding, and installing non-native stuff. The Marys and Johns cannot be there every day to supervise, so please, do not pull anything out or put anything in. We are trying to create a native landscape, and that means stuff that grows here naturally. On the Bright Side. Many gardeners and others attended a meeting in early November to talk about the re-configuration of the individual garden plots. 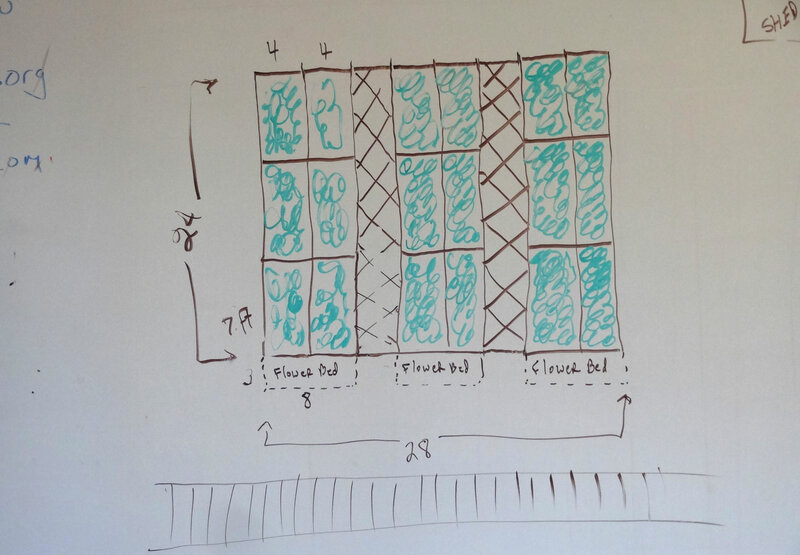 Huge thanks to Howie Alfred for sketching out a plan that would provide at least 18 plots of uniform size. (It is – more or less – on the white board in the club house). The garden would be in one enclosed grid – rectangle – that would permit easy mowing around the perimeter, and easy access to the beds. Among other things, we will be inviting members who might want to garden their own small space to sign up. We are thinking about a rotation system so that all who are interested will have a time to grow something. Larry Lembo, who does the mowing, loves the grid. Mower-friendly, he says. I’m not covering the part about the new shed at the front side of the property, but that’s another great new development. Jim Luton’s department. Howie’s drawing of the new garden plot layout.